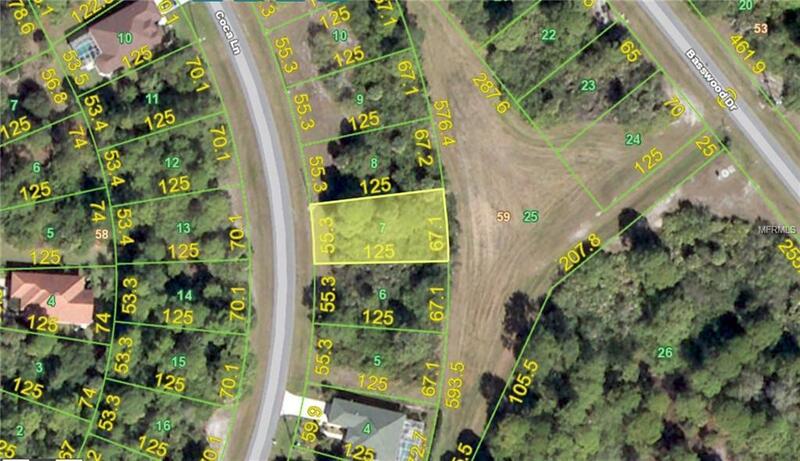 Perfect lot for your new home, just one block off Rotonda East Blvd. Backs up to nice, private greenbelt for added privacy. Water/sewer/power to site. Rotonda Lakes, a deed restricted community popular for its almost 7 mile paved Pioneer bike path that allows you to ride to Boca Grande Island. This property shares the same coast and is between Sarasota and Ft Myers but not nearly the cost. Includes a Community park, near by marina's and public boat ramps providing access to the Gulf of Mexico. Waterfront dine and enjoy amazing sunsets, endless water activities on island beaches. Surrounded by golf courses and world class fishing. Enjoy spring training baseball at the Charlotte County sports complex and regular scheduled activities at the local fairgrounds which are just minutes away. Major retailers such as Publix, Walmart and Home Depot are a short drive.This lot is ready to build on with all utilities available. We have many additional hand picked lots offering some of the best building sites in the area. If you are thinking of building we would gladly assist you with that process. 4 Major airports with in a 100 Miles. Punta Gorda has 24, nonstop destinations for easy commuting. 2 -3 hours to major attractions such as Busch Gardens and Disney. It is time to buy. Come take advantage of todays pricing and see what the Florida life style is all about.